"I made all my films like a sleepwalker. I did what I thought was right. I never asked anyone, 'Is this right or wrong?'" My first experience with director Fritz Lang was in my junior year of high school. For reasons I don't remember, my English teacher decided to show Lang's 1927, silent film, Metropolis to an unimpressed class. Personally, I was blown away by the film and to this day still consider Metropolis one of the greatest movies. Unfortunately what we were watching was the hideously butchered 87-minute version that had been altered with an awful, contemporary, rock-n-roll soundtrack. In the required essay the class had to write about the film, I commented that we should have watched the film as originally intended with the orchestral soundtrack. When I received the paper back, my teacher had written, in angry, red pen, "I don't think the class would have liked to listen to ragtime piano through the whole film, do you?" Ragtime piano? Needless to say, I didn't get along with her too well that year. Since then, I've seen several of Lang's films, though certainly not all of them. I've come to respect his work and admire his visionary achievements, especially in his early, German phase with groundbreaking work like Spiders, Dr. Mabuse: The Gambler, the Nibelungen films, M, Spies, and, of course, the aforementioned Metropolis. Lang, desiring to move away from the pressures of working in Nazi Germany, made his move to Hollywood where he enjoyed surprising success, but nowhere near the level of artistic control and experimentation he would have preferred. His life had mystery associated with it, as well as controversy, but certainly his imprint on cinema cannot be denied. His art is of staggering quality and ambition, and perhaps no director so comfortably made the jump from the silent age, to the sound age, able to utilize sound as an effective tool rather than as a gimmick. After all, what would M have been without In The Hall Of The Mountain King being whistled by Peter Lorre every time he felt the urge to murder children? The documentary Circle Of Destiny seeks to provide a concise, solid biography of Fritz Lang. From interviews with those that worked with him and those that were inspired by him, director Jorge Dana hopes to paint a picture of this radical personality. Like many great artists, though, Lang can only be understood so much... the rest went with him to the grave. Although 54 minutes may sound a bit short for a documentary on someone with an extensive career like Lang, the documentary focuses more on the man himself rather than his movies. Dana wisely does away with spending much time on Lang's Hollywood years mainly because it would seem that his contemporaries and friends regarded them as a low point for him, despite the fact that Lang uncovered many famous stars and worked with some of America's biggest legends. The people interviewed for the film come from various places; some worked with Lang, while others merely critiqued his films, interviewed him, or in the case of Patrick McGilligan, sought out to learn more about his life. Of course, some have focused more on the negative aspects of his career. For many years he had a relationship with Thea von Harbou who, despite providing brilliant inspiration for movie ideas, was also a staunch supporter of the Nazi Party. Yet, Lang himself ran into trouble with the Nazi government when The Testament of Dr. Mabuse featured a character that spouted pro-Nazi rhetoric, despite being portrayed as a psychotic. Much has also been made of his brutal, harsh treatment of actors and crew. This documentary treats these subjects as something fairly minor, though, preferring to take positive memories and cryptic experiences with Lang as it's center. Is it an authoritative feature? Well, no, but then an authoritative look would probably be more like 4 or 5 hours. Would it be a better film? Probably not. Image Transfer Review: Presumably a high-definition program, Circle of Destiny is cropped to 1:78:1. The quality and style of the presented material varies very much. Some interview segments look fantastic and crisp, as you might expect from a hi-def feature. Others are extremely grainy with heavy movement and shimmer in the background. Some material is framed at 1:33:1, presumably filmed with different cameras. Of course, footage from Lang's own films is windowboxed at around 1:37:1. Most of the footage looks gorgeous given the age, too bad the majority of these works are not on DVD, and some of the ones that are look terrible. So, the transfer is basically mixed between different sources, but certainly satisfying and what you'd expect. Oddly enough, though, there is no anamorphic enhancement. Audio Transfer Review: There's not much going on in the audio department since this is essentially an interview based piece. Some elements of the musical score are put into stereo, but 99% of the film is just people talking, which comes across fine in a Pro-Logic center channel. Extras Review: There are no additional features other than the inclusion of subtitles to handle the German and French speakers. The main menu is the chapter selection, and that's it. There is no keepcase insert (other than an Image advertisement). 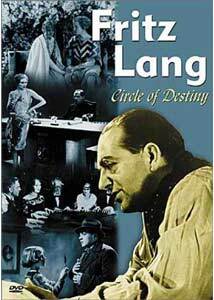 Circle of Destiny makes an excellent supplement for anyone who loves the films of Fritz Lang. Obviously, it depends on the viewer whether or not rental or purchase is warranted, but this would make a good educational film for film classes and the like.